As you will soon see from this post, our stop in Alamogordo was full of fun and adventure — even with the ongoing federal government shutdown continuing to thwart some of our activities. Alamogordo, a city of about 30,000 residents located in the Tularosa Basin of the Chihuahuan Desert — and bordered on the east by the Sacramento Mountains and Lincoln National Forest and on the west by White Sands National Monument, offers much in terms of nature, history, science, pistachios, and wine-tasting! White Sands National Monument protects 224.6 square miles (about 144,000 acres) of rare white gypsum sand dunes — that date back to millions of years ago when the ancient Permian Sea covered the land with deep layers of gypsum; later, mountains emerged and water from melting glaciers carried the sand down to the remaining basin. Wind and sun in shallow lakes and playas then separated water from the gypsum, forming selenite crystals — which were then further broken down by wind and water into sand. Just wow. 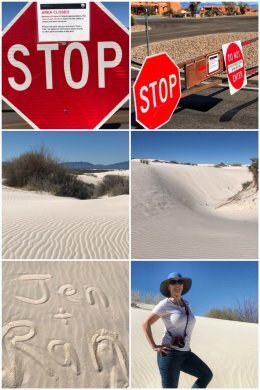 The park — when it is open — has a visitor center and multiple trails to explore, including Dune Life Nature Trail, Playa Trail, and Alkali Flat Trail — as well at the Dunes Drive, a 16-mile partial loop that offers access to the trails, picnic areas, overlooks, and bathrooms. After finishing our secret foray into White Sands, we continued southwest toward Las Cruces, through the White Sands Missile Range and over and into the Organ Mountains-Desert Peaks National Monument, managed by the Bureau of Land Management (BLM), and established by President Barack Obama in 2014 to protect significant prehistoric, historic, geologic, and biologic resources of scientific interest. The park includes four areas: the Organ Mountains, Desert Peaks, Potrillo Mountains, and Dona Ana Mountains. We spent our afternoon hiking around the Dripping Springs Natural Area, which includes several trails. 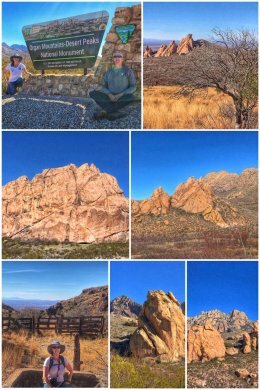 We hiked the La Cueva Trail (about a 1.5-mile RT hike that leads to a natural cave situated in volcanic rock and used as a shelter by ancient peoples) and the Dripping Springs Trail (a 3-mile RT hike that leads to a waterfall and the ruins of an old hotel-turned sanatorium). The Organ Mountains are a steep, angular mountain range with rocky spires that rise majestically above the Chihuahuan Desert floor to an elevation of 9,000 feet. This picturesque area of rocky peaks, narrow canyons, and open woodlands ranges from Chihuahuan Desert habitat to Ponderosa Pine in the highest elevations. Next up it was time to be nutty and taste some more New Mexican wines! 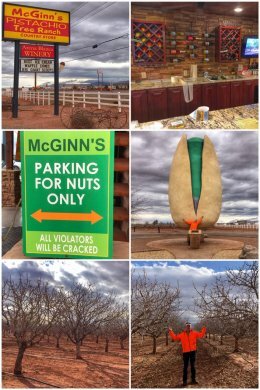 We started at McGinn’s Pistachio Tree Ranch and Arena Blanca Winery, home of the world’s largest pistachio nut (a 30-foot sculpture dedicated to the farm’s founder, Thomas McGinn)! The gift shop at McGinn’s will blow your mind — including quite a few different spicy and sweet varieties of pistachios to sample. Their stash also includes New Mexican salsas, honey, and jams and jellies… as well as typical touristy stuff. We left with a bottle of their Outlaw Red and Pomegranate wines, as well as a bag of garlic pistachios and one of sugar-free, cinnamon flavored pistachios. We also took a fun little bus tour through the vineyard and nut grove. Our guide, Carlin, was well-informed on both grape-growing and pistachio trees. We then drove less than half a mile to the other winery and pistachio farm, Heart of the Desert. Knowing us, you know we could not resist stopping at anything with a massive heart — especially a winery! We enjoyed a tasting and a walk around the grove. They also offer tours — but just once daily (M-F) at 1:30 for free, while McGinn’s offers them on the hour every day, but for $2 per person. We left with a bottle of their quite unique Pistachio Rose (a blend of white zinfandel and chenin blanc grapes, infused with pistachio) and a bottle of their Cabernet Sauvignon. 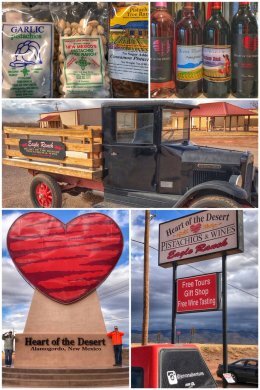 The story of Heart of the Desert Winery is dear… and it started with George Schweer, a former Air Force officer stationed at nearby Holloman AFB in 1969. He and his wife Marianne decided they wanted to stay in the Tularosa Basin and continue their farming tradition… and after some research, decided on pistachio trees in the early 1970s — and today Eagle Ranch is one of the oldest and largest groves in the state. In 2002, they decided to expand into grapes and wine and planted an initial 12,000 vines. Today, they have more than 24,000 vines growing. Even more amazing, both George and Marianne still come to work everyday! 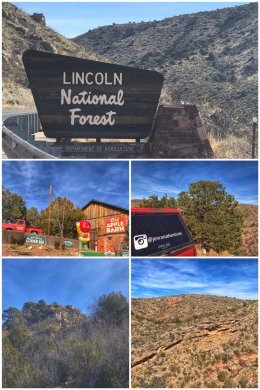 Next up was another trip out into nature — into the Lincoln National Forest, just east of Alamogordo — and a hike on a very interesting rail-trail. The 1.1-million acre Lincoln National Forest consists of three ranger districts — Sacramento, Smokey Bear (where a fire-damaged bear cub rescued from a devastating forest fire in 1950 was named Smokey Bear and became the living symbol of fire awareness and prevention for the Forest Service), and Guadalupe — and three major mountain ranges: Sacramento, Guadalupe, and Capitan (with elevations that range from 4,000 to 11,500 feet and passing through five different life zones from Chihuahuan desert to sub-alpine forest). What is now the Lincoln National Forest was originally part of five forest reserves and first established in July 1902 — and named for former President Abraham Lincoln. 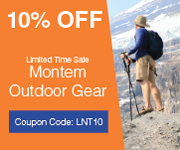 The forest provides access to camping areas, trails of varying difficulty, and several ski areas and resorts. Located in High Rolls, with a parking area and trailhead along Forest Road 162C, the Salado Canyon Trail offers two options: go to the left for about a half-mile and you can visit and cross the reconstructed Salado Canyon Trestle (a railroad bridge); and/or go to the right for a little more than a mile and hike up to the Bridal Veil Falls, where a small (45-foot) spring-fed waterfall descends next to the trail. The falls, which flow year round (and are quite unusual for a desert), were once a popular place to stop for the trains going up and down the mountain. 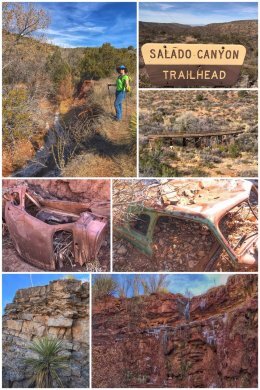 Besides the falls, be on the lookout where Salado Canyon Creek approaches the trail — and peer over the edge to see the remains of an old car and some sort of farming equipment permanently part of the creek banks — as seen in the collage above. It is so fun to think about how these vehicles ended up in the creek. Also of interest, the trail passes in the area of the Fresnal Fault zone — with accompanying geological signage. The Fresnal Fault zone is one of the main features in the southern Sacramento Mountains Escarpment — and about 300 million years ago these mountains were formed at the bottom of an ocean through the accumulation of dead sea life. Again… wow. 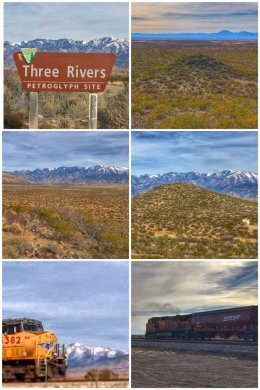 Next up was a fun adventure to yet another amazing petroglyph site, located only about 35 miles north of Alamogordo, and scattered over 50 acres of New Mexico’s northern Chihuahuan Desert. Situated on a basaltic ridge rising above the valley, the Three Rivers Petroglyph Site is an unexpected delight. 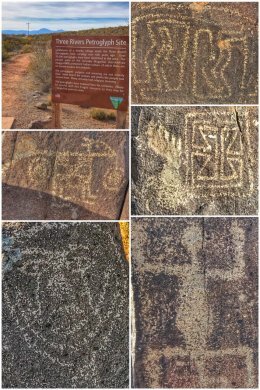 Managed by the BLM, the site contains more than 21,000 petroglyphs… including masks, sunbursts, wildlife (birds, animals, fish), handprints, and geometric designs. The number and concentration of petroglyphs make this site one of the largest and most interesting rock art sites in the Southwest — and the accessibility to the rock art right along the trail make it magnificent and fun for visitors. A fairly easy (but also rocky) 1-mile (RT) trail begins at the visitor shelter and links many of the most interesting petroglyphs, ending at a shade shelter that offers views of the San Andres Mountains to the west and the Sacramento Mountains (and Sierra Blanca, peaking at 12,003-feet) to the east. Beyond the shade shelter, experienced hikers can keep going, but very few petroglyphs exist beyond this point. A trail guide describes marked areas of the trail. The petroglyphs at Three Rivers, dating back to between about 900 and 1400 AD, were created by Jornada Mogollon people who used stone tools to remove the dark patina on the exterior of the rock. In terms of understanding the meanings of all this art… masks are used by many cultures in their religious ceremonies — and often positioned on rocks to create a three-dimensional face. Animal tracks are fairly common in Jornada rock art. Bird images are typically symbolic of rain. 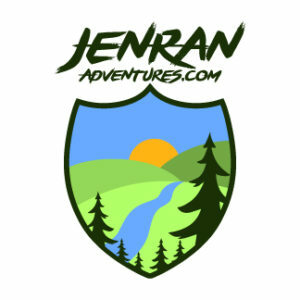 Besides the trail, the site offers limited camping and picnicking sites, some covered, some with hookups. Other tourist options while in Alamogordo include: National Solar Observatory, Toy Train Depot and Museum, Alameda Park Zoo, New Mexico Museum of Space History (with moon rocks and an IMAX theatre). A bit further out — and open only ONE day a year — you can find the Trinity Site National Historic Landmark (where the first atomic bomb was tested). Next up, we head to Carlsbad, New Mexico, with the hopes of visiting our next two national parks — the first of 2019.